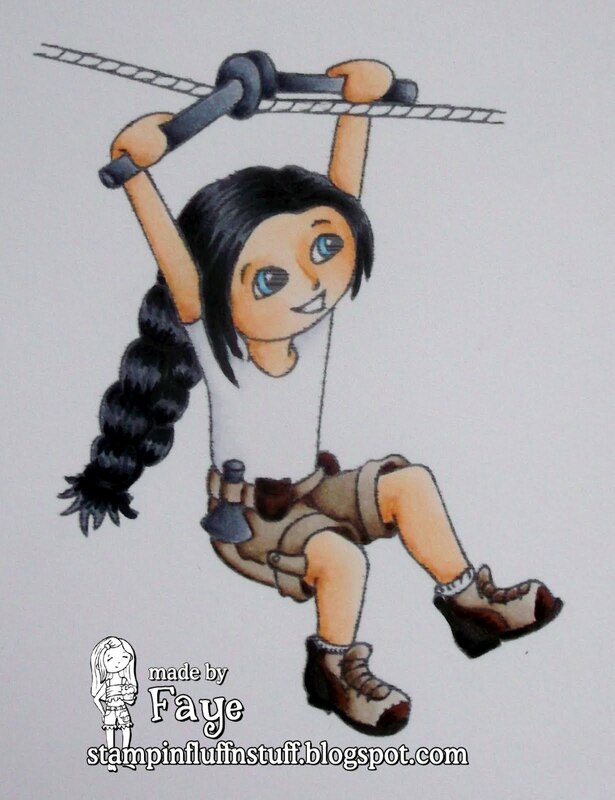 This is Agent Bubblegum Zipping, isn't she cool? Anyhoo, the Challenge for the next fortnight over at Little Miss Muffet is Circles. Simples, right? Take a looksie at what the rest of the girls have created. Take your time though, you don't want to get dizzy! I 'needed' to go to Next Home the other day. In fact, my need was so great, I can't even remember what I think I 'needed' now, but anyway! Before Sweet Cheeks and I went in, we had a little chat about not touching things because they might get broken and generally being careful. Things were progressing well, we went up the escalator, (only once, which was a novelty, sometimes it can get like Groundhog Day.) and Sweet Cheeks seemed happy enough to just 'look with your eyes'. He was a few paces behind, when I heard him say 'you mustn't touch anything, you might break it'! Luckily the 'a bit cheeky lady' thought it was quite cute and agreed wholeheartedly with The Cheeks. And I thought no one listens to me! What a kool card. Love the image and CAS look. Just perfect. Amazing card, Fluffy...love your coloring and the cool clouds! Sweet Cheek is so sweeeeet!!! Fabulous image and a great shape. Love your sky background too!! Gorgeous card, The image is fabulous and coloured perfectly. I love the way you have done the sky. Your little story made me chuckle - thanks so much for cheering me up this morning!!! 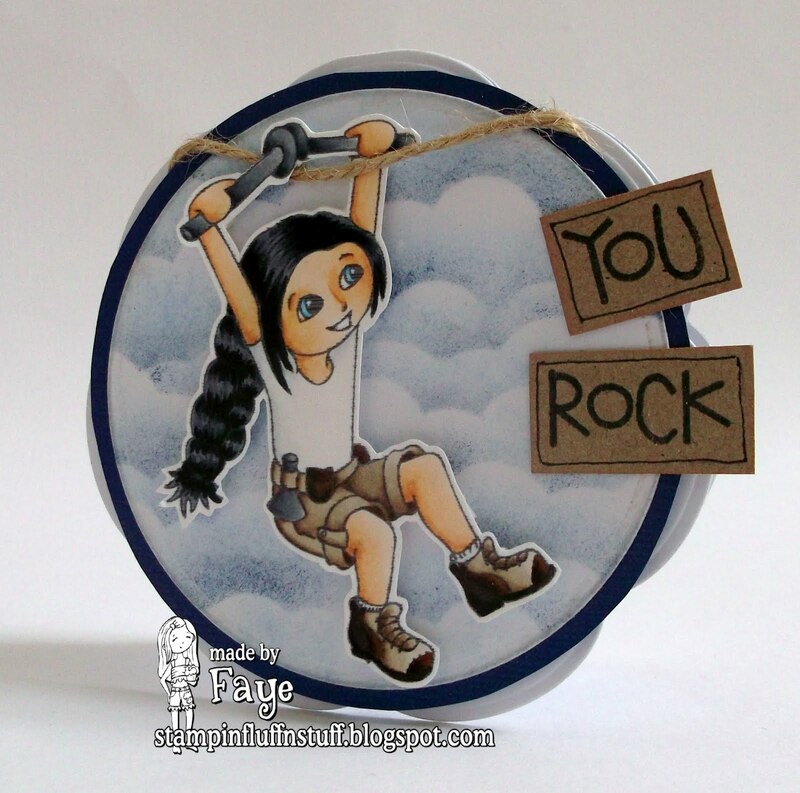 morning Faye..this is just adorabe...love how you have added the little piece of rope..fabby!! Fab card Faye and what a fun story! Lol Faye! Your wee man sounds so cute! Gorgeous card! I love the clouds you have added! Fab colouring too! Cute image and fab colouring! Love the rope you added!! Fabulous coloring! A zippingly great card, Fluff. Such a brilliant card for a tomboy Faye - love it! What a great image and a wonderful card. You're colouring is fabulous. 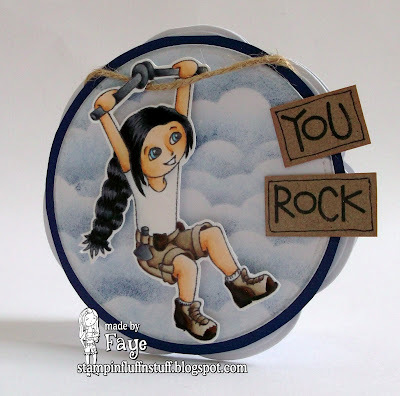 Thanks for sharing with us over at the Craft-Room Challenge, and good luck. What a cool image! Your coloring is awesome. The shape is great and I like the sentiment that goes over the edge. Spotted this on MIM. Great image Faye and amazing clouds. Love this card. Sweet Cheeks is just too cute. It's a small small world! Just popping over from MIM to say I saw you there. Hugs Mrs A.
Super card Faye and such a fun image. Great colours. Hi Faye, really cute one this time and love the clouds - perfect. PS - We checked and there are 3 boys and 2 girls. I will suggest to Miss Miss T that she calls one Boo 2 - I think it might be a keeper (in more ways than one!). Love your fabulous cute card Faye. Love the card with the jute thru her hands and I bet you are gonna have your hands full when Sweet Cheeks gets older, I have a feeling he is a "mini-Faye!"